Learn@OregonState aims to provide an experience that enables the OSU community to thrive within the OSU teaching and learning ecosystem institution-wide via access to enterprise educational tools, timely information, practical guidance, and resources. As part of a web portal taskforce, my primary role was to lead the visual design and branding components of the project and make recommendations for UI of the site. I collaborated with a student designer to develop an identity mark and branding system for the Learn@OregonState communications and web presence. We developed a distinct look that remained visually faithful to OSU's branding guidelines. 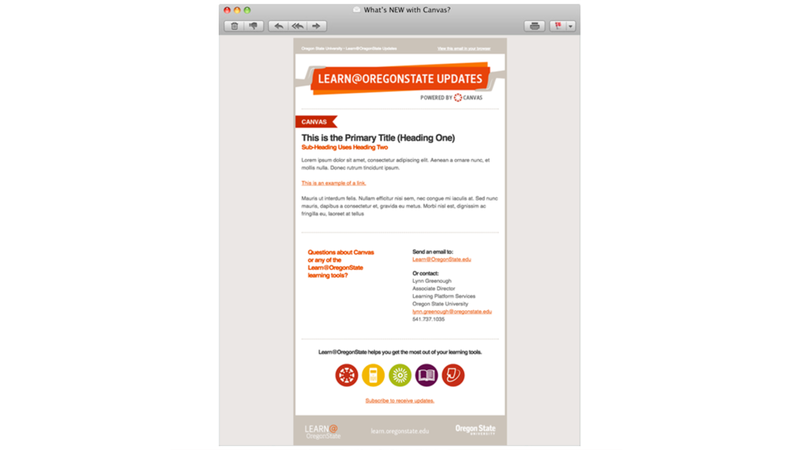 Learn@OregonState is a centrally supported collection of primarily digital tools. The hands used in the communications campaign remind the audience that digital learning remains a hands-on experience. The often first person view of the hands allows the viewer to easily envision themselves in the situation. It also provides longevity to the images and easy reproduction of concepts for involved departments that are less artistically supported. The brightly colored asymmetrical footers and dotted lines - which make use of the OSU color palette - add energy and personality to the photography and help to differentiate between different tools within Learn@OregonState.